can be posted at the bottom. There aren't many cases that stretch the boundaries of social norms as much as that of Benjamin Buffum and his second wife, Sophia Wheelock. Sophia had at least four children out-of-wedlock, all of whom identified their father as Benjamin Buffum, and all of whom were born while Benjamin was married to Olive Wheelock, Sophia's half-aunt. The family of Benjamin Buffum and his first wife, Olive Wheelock, is well documented. But genealogies have ignored his second wife, Sophia Wheelock.1 With a little digging, however, the clues are easily found in the records of Providence County, Rhode Island, and Worcester County, Massachusetts. This article will examine those records, establish the identity of Sophia Wheelock, show that the Benjamin Buffum who married Olive Wheelock is the same man that married Sophia Wheelock, and explore the likelihood that Benjamin was the father of Sophia's children. Who were the parents of Sophia Wheelock, and what was her relation to Olive? Was this the same Benjamin Buffum that married Olive Wheelock in Uxbridge, Worcester County, Massachusetts? Was this the same Benjamin Buffum that fathered four out-of-wedlock children with Sophia Wheelock in Douglas, Worcester County, Massachusetts? The U.S. and Massachusetts state census enumerations show that Sophia and Benjamin lived in Douglas, Worcester County, Massachusetts, consistent with the residence of Benjamin given in the marriage record. See Table 1 below for a tabulation of the census entries for Sophia (Wheelock) Buffum, from 1850 to 1900, all in Douglas. Note that in 1865, Sophia Buffum was listed as widowed. This is consistent with the 1861 Douglas death record for her husband, Benjamin Buffum.11 Also, note that she does not appear in census records after 1900, consistent with her 1901 Douglas death record.12 Finally, note that Sophia was not living with Benjamin Buffum in 1860. That seeming inconsistency is discussed later. The 1900 census lists her birth date as Oct 1805, in Rhode Island. This date is in line with the other census records, though most (excepting 1850) incorrectly identify her birth place as Massachusetts. Carlyle Capron Wheelock, in his "Wheelock Genealogy" manuscript, identifies her birth date as 31 October 1804, born in Coventry, Kent County, Rhode Island, and her parents as Phyletus Wheelock and Avis Handy, of Burrillville, Providence County, Rhode Island.13 Caryle Wheelock cites Thomas Seabury Wheelock as his source. Thomas was a credible source. He was himself a genealogist.14 He was also Sophia's nephew, and a son of Sophia's twin brother, Godfrey Wheelock. The given birth date (31 October 1804) is inline with census records. Sophia's father, Phyletus Wheelock, lived in Burrillville between 1820 and 1840. He died in 1841, and is buried in Burrillville.15 This is consistent with Sophia's place of marriage - Burrillville. Unfortunately, Sophia's 1901 death record does not identify her parents, but the information provided by Thomas Seabury Wheelock in "Wheelock Genealogy", along with the census records, and the corroborating facts shown above are sufficient to firmly establish her parentage, birth date, and her place of residence. Census records suggest that Sophia might have been living with Benjamin and Olive in 1820. Sophia's mother died in 1817, when Sophia was eleven years old, providing motive for Sophia to move to a new household.20 There is no child of her age in her fathers household in 1820 in Burrillville, but there is, unexpectedly, someone of Sophia's age (15) in Benjamin and Olive's household in Douglas.21 It is possible that Sophia went to live with her half-aunt when her mother died. This, of course, would have provided ample opportunity for Sophia and Benjamin to develop a relationship. and show that each child identified Benjamin Buffum as their father. All of these records contain people whose mother is identified as Sophia Wheelock (or Sophia Buffum). All records, except the 1844 marriage record for Emeline Wheelock, identify the father as Benjamin Buffum. For now, no assumption is made about the identity of this Benjamin. Phebe Buffum, born (calculated) 2 September 1821 in Douglas, married Wellington Young, died 1 October 1910 in Douglas. Emeline Buffum (aka Wheelock), born (calculated) 4 May 1825 in Douglas, married Albert Whipple 18 April 1844 in Douglas, died 4 March 1911 in Uxbridge. Phyletus Buffum, born circa 1841 in Douglas, married Ellen Humes 24 May 1863, probably in Douglas. Loren A. Buffum, born (calculated) 2 May 1843 in Douglas, married Ellen Maria Shove 26 October 1864, in Cumberland, Rhode Island, died 23 January 1925 in Douglas. Note that each of the four children of Sophia was born before Benjamin and Sophia were married in 1849, presumably out-of-wedlock. The following sections will present additional records that corroborate this, and are consistent with all information about Sophia's children presented above. This is found in the Douglas town birth records, which were transcribed from older records in 1899, and therefore cannot be derived from her 1911 death record. No father is identified in this record. Also, Sophia's status as single is explicitly indicated. Julius does not appear in any further records. Given their near identical birth dates, it is reasonable to conclude that Loren and Julius are probably the same person. Another less likely possibility is that Julius was a twin of Loren who died young. In summary, these records provide additional confirmation that Sophia bore several children out-of-wedlock. Furthermore, they are consistent with the birth dates derived from the death records. Sophia's application for a pension based on the Civil War service of her son, Phyletus Buffum. Sophia specifically identified Phyletus as her son, as did Wellington Young (Sophia's son-in-law) in a separate affidavit. The death date of Phyletus is identified as 3 July 1867. He died leaving no wife or children.32 This is all consistent with Phyletus's lack of appearance in the census records after 1865, and his marriage record, which identifies his mother as Sophia. Sophia's 1901 Worcester County will, in which she leaves (1) fifty dollars to Emeline Whipple, widow of Albert Whipple, (2) fifty dollars to Phebe Young, wife of Wellington Young, (3) one hundred dollars to her son, Loren A. Buffum, and (4) the residue of her estate to Emogene A. Hathaway, Walter A. Buffum, Elsie May Buffum, children of her son Loren A. Buffum, to be equally divided.34 This list of heirs is consistent with the children of Sophia presented above. Finally, the census records presented in Table 1 are also consistent with the four children of Sophia Wheelock as identified above. She is living with them in 1860, 1865, 1880 and 1890, as shown in Table 2 below. In 1870 she is living with a grandson. These records paint a consistent picture of four out-of-wedlock children born to Sophia Wheelock in Douglas. All births occurred prior to her 1849 marriage to Benjamin Buffum. And all four children directly or indirectly (through their informants) identify Benjamin Buffum as their father. The following sections will focus on the Benjamin Buffum who married Olive Wheelock, and show that this was the same man that married Sophia Wheelock. This section will review what is known about the family of Benjamin Buffum and Olive Wheelock. This background is necessary for proving that he was same man that married Sophia Wheelock. Farnum Buffum, born 1819, died young. There are a couple things to note. First, Olive (Wheelock) Buffum died in 1848, a year earlier than the marriage of Sophia Wheelock and Benjamin Buffum. This is consistent with the theory that the same Benjamin Buffum married both women. Second, note that Benjamin had a son named Benjamin, who married a woman whose given name is Rosamond. This is important background for interpreting the deeds that will be discussed in the next section. This section will establish that the Benjamin Buffum who married Olive was the same Benjamin Buffum who married Sophia. Two arguments will be presented, one based on census records, and the other based on land records. Each of these deeds is signed by the grantor, and the spouse. The first deed is signed by Benjamin and Olive. The second deed is signed by Benjamin, Jr. and Rosamond. The third deed (ammended) is signed by Benjamin and Sophia. Since it can be proven that the grantor, Benjamin Buffum, is the same man in the first and third deeds, this set of transactions provides direct evidence that the Benjamin who married Olive is the same man that married Sophia. The details of these deeds and a full explanation of the argument is included in Appendix One. In summary, the land records are consistent with the census records, and show with certainty that it was the same Benjamin who married both Olive and Sophia. The remaining sections will explore whether or not this same Benjamin Buffum was the father of Sophia's children. Was Benjamin Buffum the Father of Sophia's Children? Are these records credible? All were created after Benjamin Buffum's death in 1861. Prior to that date, birth and marriage records simply omitted the name of the father. There is at least one reason to think they may not be credible - that they may instead be records of social convenience. It is possible that the four children of Sophia, born out-of-wedlock, identified Benjamin as their father simply because he was the one and only man that married their mother. Identifying him as their father served to socially legitimize their births. Of course, there is another perspective to take - namely that these records are correct, and should be taken at face value. All these records are consistent. They span more than six decades. Each record has a different informant, all of whom agree. The following sections will outline evidence that sheds light on each of these perspectives. The fact that Phyletus and Loren did not live with Benjamin at various points during the decade of the 1850s could signal that he was not their father. Could the different households provide clues to their paternity? Phyletus lived with Asa T. Dudley in 1855. Is it possible Asa was a close relative? Asa, born circa 1832, would have been too young to be his biological father. Asa's father, Samuel Dudley was old enough to have been Phyletus's father, but Samuel did not mention Phyletus in his 1847 will, nor did Phyletus make any claim against the estate.61 This probate record shows no evidence of kinship. Loren lived with Stephen Paine in 1860, begging similar questions. Stephen Paine was old enough to have been his father. But he died intestate in 1864, and Loren is not listed amongst the "only next of kin," nor did he make a claim against the estate.62 Again, no evidence of kinship. It is entirely possible that the family simply could not afford to live together. Children were put in different households to save money. To summarize the census records - the 1850 census shows the entire family living together - perhaps a sign that Benjamin is the father of Loren and Phyletus; but the 1855 and 1860 census records, showing the family living apart, does not necessarily imply that Benjamin is not the father - it may have been a purely financial consideration. The use of surnames by Sophia's children might also provide clues to their paternity. What light does this shed on the identity of the father? The only child to have consistently used the Buffum surname is Phebe, whose given name, incidentally, is the same as Benjamin Buffum's mother. This would argue in favor of Benjamin as her father. The other children (Emeline, Phyletus) mostly used the Wheelock surname until Benjamin died, at which point they all consistently use Buffum. Loren is the exception. He is listed with the Buffum surname in 1855 and 1860 census enumerations, prior to Benjamin's 1861 death. Benjamin was not the father of Sophia's children (or at least, not all of them). But using his surname, and identifying him as the father provided a socially acceptable fiction to legitimize their births. Benjamin actually was their father. A word of caution is probably in order. The surnames that appear in the census records are only as good as the informant that provided the information to the census taker. Since we don't know who the informant is, it is entirely possible that the surnames appearing in the 1850, 1855, and 1860 census listings do not reflect the actual surnames of the individual. Instead, they reflect the surnames as known by the informant. This would explain, for example, why Sophia appears as Buffum in the 1850 and 1855 census, as Wheelock in the 1860 census, and as Buffum thereafter. Phebe's surname may be more telling. It is consistently listed as Buffum in the town records. If it could be known with certainty that Phebe's birth record was created at the time of her birth (and not, say, forty years later when her first child was married), then more weight could be attached to the surname as an indicator of her paternity. But the provenance of her Douglas birth record is unclear. In 1899 it was copied and alphabetized from earlier records that were in poor condition. The location of the earlier records is unknown; so their origin cannot be determined. If Benjamin was the father of Sophia's children, then land transactions might be expected between Sophia's children and Benjamin, or between Sophia's children and Olive's children. The two sets of children would have been half siblings (or perhaps slightly more than half, since Olive and Sophia were closely related). Multiple land transactions have been found between Olive's children and their father, Benjamin, as expected; but none have been found between Sophia's children and Benjamin, as might be expected if Benjamin was their father. However, a few land transactions are recorded between Sophia's children and Olive's children. Between 1861 and 1863, Albert and Emeline Whipple (Sophia's daughter) sold land to several of Olive's children (Benjamin, Daniel and Farnum), as well as one of Sophia's children (Loren).78 Family relationships are not explicitly spelled out in the deeds, but the mere existence of the transactions adds some credibility to the thesis that Benjamin is their common father. a mention of siblings in the wills of Sophia's or Olive's children; specifically a mention Sophia's children in the wills of Olive's children, or vice versa. The first two scenarios yield no positive evidence. Benjamin Buffum left no probate records, possibly because he owned nothing when he died. His parent's both left wills.79 Both mentioned children, but no grandchildren, and therefore no mention of Sophia's children. The probate records of Olive's children yielded some positive evidence. (Refer to the list of Olive's children in a previous section.) First, the negative results. Paul Buffum's will identifies his siblings - none are Sophia's children.80 The probate records of Hannah (Buffum) Slocumb have not been fully examined. The documents that have been inspected include the letter of administration, and the administrators bond, neither of which make any reference to Sophia's children.81 Next, the positive results. Daniel Buffum's will also identifies his siblings - again, none are Sophia's children. However, Albert Whipple (Sophia's son in law) was appointed appraiser.82 Farnum Buffum died intestate; and again Albert Whipple was appointed to appraise the estate.83 While this is not a strong positive signal that Benjamin Buffum was the common father of Olive and Sophia's children, it at least provides some positive evidence. The simplest interpretation may be that which directly fits the evidence, namely that Benjamin Buffum was the father of all of Sophia's children. There is no direct (or even indirect) evidence to contradict this conclusion. The records, spanning a hundred years, point in that direction. But it does demand an unusual degree of tolerance, or indifference (willful or otherwise) from Olive, Benjamin's first wife, and from the community. This is especially true if Sophia lived with Olive and Benjamin, as the census records suggest (see Appendix Two). oral history of Sophia's descendants. For now, there is much evidence to recommend that Benjamin Buffum was the father of Sophia's children; but there is enough reason to doubt the accuracy of the key components of the evidence (namely the marriage and death records of Phebe, Emeline, Phyletus, and Loren) that their paternitfy remains less than certain. This appendix will outline in detail the evidence contained in the Worcester County land records showing that the Benjamin Buffum who married Olive Wheelock is the same man that married Sophia Wheelock. Refer to Figure 1 for a graphic showing the land transactions. Olive is identified as Benjamin's wife in the first deed, Sophia in the third (ammended) deed.90 If the Benjamin Buffum who signed the first deed is the same man that signed the third deed, then it provides direct evidence that Olive and Sophia married the same man - not two different men with the name Benjamin Buffum. The names on the first two deeds (Benjamin and Benjamin, Jr) suggest a father son relationship. The second deed confirms this. In that deed, Benjamin, Jr conveyed 40 acres in Douglas for $1 to his father "in further consideration of the love and affection I bear to my father." Furthermore, this deed identifies the 40 acre parcel as a portion of that conveyed in the first deed, and identifies the Benjamin and Benjamin Jr in the second deed as the same people in the first deed.91 Finally, the second deed refers to an earlier 1838 deed to identify the metes and bounds of the property.92 The second deed is signed by the wife of Benjamin Buffum, Jr., Rosamond - proving that the Benjamin Buffum, Jr. referenced in this deed is the son of Benjamin Buffum and Olive (Wheelock) Buffum. These first two deeds clearly establish the identity of the two Benjamins. That is: Benjamin Jr lives in Uxbridge, is married to Rosamond, and is the son of Benjamin who lives in Douglas, and is married to Olive. What remains is to show that the Benjamin Buffum in the third deed is the same man in the first two deeds, the father of Benjamin Jr. There is a tiny chance that the 40 acre parcel was sold by Benjamin Buffum to another man named Benjamin Buffum between 22 January 1853 and 31 March 1853, i.e. between the dates of execution of the second and third deed. If this were true, then no claim could be made that the grantee in the second deed was the grantor in the third deed. However, no other transaction involving this 40 acre parcel was found in the Worcester County grantor or grantee index between these two dates; rendering it nearly certain that the Benjamin in the second deed is the same man in the third deed.97In summary, these deeds provide direct evidence that the man who married Olive also married Sophia. Furthermore, the dates on the deeds signed by Olive and Sophia are consistent with the date of Benjamin and Sophia's marriage. This appendix shows that the people enumerated in the household of Benjamin Buffum of Douglas in the 1820 through 1840 census are of the right number and age to include Sophia Wheelock and her four children. The tables below show the census enumerations for Benjamin Buffum, of Douglas, in the years 1820, 1830, and 1840.98 The decades after that are not shown - by then Olive had died, and her children had married and moved into new households. For each year, the age range and gender is shown in the left column, with possible matching names in the right column. The bold names correspond to Sophia and her children. Table 3 shows two three people in the household of Benjamin Buffum in 1820 that can't be accounted for based on the known members of his family. One, however, is the right age to be Sophia Wheelock, Olive's half-niece. This is consistent with the fact that Sophia does not appear to be living with her father in 1820. By 1830, Sophia had two children, Phebe and Emeline, both of whom have matching entries in the 1830 census that cannot be filled by Olive's children. By 1840, Sophia's daughter Phebe had married and probably moved out, as had three of Olive's children, Paul, Daniel, and Benjamin. There are no people of the right age to account for any of them in Benjamin Buffum's 1840 household. However, there are two females of ages that don't match any known children of Olive, but match Sophia and her daughter Emeline perfectly. Farnum's age does not appear to have been tabulated correctly in the census, probably a mistake. The record is incorrect. Other records of her marriage do not specify her residence as Burrillville. She moved to Burrillville sometime between 1830 and her 1840 marriage. 1See, for example, Owen A. Perkins, Buffum Family, Vol. 2 (Buffalo, NY : Buffum Family Association, 1983), p. 168; or Charles H. Buffum, "A Partial Record of the Buffum Family in New England," p. 33, manuscript, Mss A 4939, New England Historic and Genealogical Society, Boston, Massachusetts; or David Buffum, The Buffum Family of Rhode Island (Newport, RI : FW Marshall Printer, 1890). 2"New England, Select United Methodist Church Records, 1787-1922," Ancestry.com (https://search.ancestry.com/search/db.aspx?dbid=9134 : accessed 30 Jan 2019), Theological Library, Southern New England United Methodist Church Records, Bridgeton, Rhode Island, Laurel Hill Methodist Episcopal Church; see also James N. Arnold, Vital Record of Rhode Island, 1636 - 1850: First Series, Births, Marriages, and Deaths, Burrillville, Vol 3, Part 2 (Providence: Naragansett Historical Publishing, 1892), p. 16; digital images, Ancestry.com (https://search.ancestry.com/search/db.aspx?dbid=3897 : accessed 25 March 2019), "Rhode Island, Vital Extracts, 1636-1899." 3Arnold, Vital Records of Rhode Island, 1635 - 1850, Vol 3, Part 2, Burrillville, p. 16. 41850 U.S. census, Douglas, Worcester County, Massachusetts, dwelling 140, family 137, pg. 343 (stamped), Benjamin Buffum household; National Archives and Records Administration (NARA) microfilm publication M432, roll 341; digital images FamilySearch.org (https://familysearch.org/ark:/61903/1:1:MD94-9QC : retrieved 25 March 2019), indexed under "Benjamin Huffman." 51855 Massachusetts state census, Douglas, Worcester County, Massachusetts, dwelling 102, family 122, Benjamin Buffum household; State Archives, Boston; FHL microfilm 953,962; database with images,FamilySearch.org (https://familysearch.org/ark:/61903/1:1:MQ48-D37 : accessed 25 March 2019). 61860 U.S. census, Douglas, Worcester County, Massachusetts, dwelling 344, family 379, pg. 505 (handwritten), Sophia Wheelock in Willard Whipple household; NARA microfilm publication M653, roll 533; digital images, FamilySearch.org (https://familysearch.org/ark:/61903/1:1:MZH2-YXZ : accessed 25 March 2019). 71865 Massachusetts state census, Douglas, Worcester County, Massachusetts, dwelling 52, family 53, Sophia Buffum in Albert Whipple household; State Archives, Boston; FHL microfilm 954,380; database with images, FamilySearch.org (https://familysearch.org/ark:/61903/1:1:MQHT-3MY : accessed 25 March 2019). 81870 U.S. census, Douglas, Worcester County, Massachusetts, dwelling 41, family 84, pg. 623 (stamped), pg. 9 (handwritten), Sophia Buffum in the Wm. M. Young household; NARA microfilm publication M593, roll 652; digital images, FamilySearch.org (https://familysearch.org/ark:/61903/1:1:MDQZ-1XZ : accessed 25 March 2019). 91880 U.S. census, Douglas, Worcester County, Massachusetts, ED 807, dwelling 75, family 144, pg. 16 (handwritten), Sophia Buffum in the Loren A. Buffum household; NARA microfilm publication T9, roll 563; digital images, FamilySearch.org (https://familysearch.org/ark:/61903/1:1:MHF9-92L : accessed 25 March 2019). 101900 U.S. census, Douglas, Worcester County, Massachusetts, ED 1603, dwelling 149, family 175, pg. not given, Sophia Buffum in the Loren A. Buffum household; NARA microfilm publication T623, roll 691; digital images, FamilySearch.org (https://familysearch.org/ark:/61903/1:1:M9BM-XWK : accessed 25 March 2019). 11Massachusetts State Archives, Worcester deaths, 1861, Benjamin Buffum, vol. 149, p. 315; "Massachusetts: Vital Records, 1841-1910," digital images, AmericanAncestors.org (AmericanAncestors.org : accessed 3 Feb 2019). 12Douglas deaths, 1901, Sophia Buffum, vol. 518, p. 304; Vital Records, Massachusetts State Archives, Boston; "Massachusetts: Vital Records, 1841-1910," digital images, AmericanAncestors.org(https://www.americanancestors.org/search/databasesearch/191/massachusetts-vital-records-1841-1910 : accessed 3 Feb 2019). 13Carlyle Capron Wheelock, Winifred (Thomson) (Argersinger) Gonseth, "Wheelock Genealogy," p. 167, manuscript, Mss 792, New England Historic and Genealogical Society, Boston, Massachusetts. 14Lewis Wilder Hicks, Thomas Seabury Wheelock, Mr. Ralph Wheelock, Puritan (Hartford, Connecticut: Case Lockwood & Brainard, 1899); digital images (https://archive.org/details/mrralphwheelockp00hickrich/page/n8 : accessed 25 March 2019). 151820 U.S. census, Burrillville, Providence County, Rhode Island, p. 4 (handwritten), Philetus Wheelock household; NARA microfilm publication M33, roll 117; digital images FamilySearch.org(https://familysearch.org/ark:/61903/1:1:XHG9-K3RC : retrieved 25 March 2019); also 1830 U.S. census, Burrillville, Providence County, Rhode Island, p. 305 (handwritten), p. 305 (stamped), Philetus Wheelock household; NARA microfilm publication M19, roll 168; digital images FamilySearch.org (https://familysearch.org/ark:/61903/1:1:XHP6-LNW : retrieved 25 March 2019); also 1840 U.S. census, Burrillville, Providence County, Rhode Island, p. 31 (stamped), Philetus Wheelock household; NARA microfilm publication M704, roll 505; digital images FamilySearch.org (https://familysearch.org/ark:/61903/1:1:XHYB-X4V : retrieved 25 March 2019); also Find A Grave, database and images (https://www.findagrave.com : accessed 26 March 2019), headstone photo for Phyletus Wheelock, Find A Grave Memorial no. 154463609, Seth Wheelock Lot, Burrillville, Providence County, Rhode Island, maintained by Rick Sullivan (contributor 47425941). 16James N. Arnold, Vital Record of Rhode Island, 1636 - 1850: First Series, Births, Marriages, and Deaths, Burrillville, Vol 3, Part 2 (Providence: Naragansett Historical Publishing, 1892), p. 16. 17Douglas marriages, 1863, Buffum-Humes, vol. 164, p. 164; Vital Records, Massachusetts State Archives, Boston; "Massachusetts: Vital Records, 1841-1910," digital images, AmericanAncestors.org(https://www.americanancestors.org/search/databasesearch/191/massachusetts-vital-records-1841-1910 : accessed 3 Feb 2019); also Philetus Buffum (Pvt., Regiment 24, Company H, Infantry, Civil War), pension application no. 159,188, certificate no. 120,197, "Case Files of Approved Pension Applications of Widows and Other Dependents ..., 1861-1934," Civil War and Later Pension Files, Record Group 15: Records of the Department of Veterans Affairs, 1773-2007, NAID 300020, National Archives, Washington, D.C.; database with images, Fold3.com (https://www.fold3.com/title/24/civil-war-widows-pensions : accessed 9 Mar 2019), search for "Philetus Buffum." 18Uxbridge deaths, 1911, Emeline (Buffum) Whipple, vol. 1911/99 Death, p. 249; Vital Records, Massachusetts State Archives, Boston; "Massachusetts: Vital Records, 1911-1915," digital images,AmericanAncestors.org (https://www.americanancestors.org/search/databasesearch/192/massachusetts-vital-records-1911-1915 : accessed 3 Feb 2019). 19See, for example, Roderick Sullivan, Wheelock Genealogy (https://www.WheelockGenealogy.com : accessed 28 March 2019); also Wikitree (https://www.wikitree.com/wiki/Wheelock-1569 : accessed 28 March 2019), Olive Wheelock; also Carlyle Capron Wheelock, Winifred (Thomson) (Argersinger) Gonseth, "Wheelock Genealogy," manuscript, Mss 792, New England Historic and Genealogical Society, Boston, Massachusetts. 20Find A Grave, database and images (https://www.findagrave.com : accessed 26 March 2019), memorial page with photo for Avis Handy Wheelock, Find A Grave Memorial no. 63436201, Stone-Matteson Lot, Coventry, Kent County, RI, created 29 December 2010. 211820 U.S. census, Burrillville, Providence County, Rhode Island, p. 4 (handwritten), Philetus Wheelock household; digital images FamilySearch.org (https://familysearch.org/ark:/61903/1:1:XHG9-K3RC : retrieved 25 March 2019); also 1820 U.S. census, Douglas, Worcester County, Massachusetts, Benjamin Buffum, Jr. Household; NARA microfilm publication M33, roll 54; digital images FamilySearch.org(https://familysearch.org/ark:/61903/1:1:XHGM-Y7B : retrieved 25 March 2019). 22"Douglas Records of Births, Marriages, Deaths 1844-1860, Vol 2," no page numbers, Wheelock-Whipple marriage, Douglas Town Clerk's office, Douglas, Worcester County, Massachusetts; "Massachusetts, Town and Vital Records, 1620-1988," database with images, Ancestry.com (https://search.ancestry.com/search/db.aspx?dbid=2495 : accessed 20 March 2019). 23Douglas marriages, 1863, Buffum-Humes, vol. 164, p. 164, Vital Records, Massachusetts State Archives, Boston; "Massachusetts: Vital Records, 1841-1910," digital images, AmericanAncestors.org(https://www.americanancestors.org/search/databasesearch/191/massachusetts-vital-records-1841-1910 : accessed 3 Feb 2019). 24Douglas marriages, 1864, Buffum-Shove, vol. 173, p. 189; Vital Records, Massachusetts State Archives, Boston; "Massachusetts: Vital Records, 1841-1910," digital images, AmericanAncestors.org(https://www.americanancestors.org/search/databasesearch/191/massachusetts-vital-records-1841-1910 : accessed 3 Feb 2019). 25Douglas deaths, 1910, Phebe Young, vol. 1910/34 (death), p. 475 (amended); Vital Records, Massachusetts State Archives, Boston; "Massachusetts: Vital Records, 1841-1910," digital images,AmericanAncestors.org (https://www.americanancestors.org/search/databasesearch/191/massachusetts-vital-records-1841-1910 : accessed 3 Feb 2019). 26Uxbridge deaths, 1911, Emeline Whipple, vol. 1911/99 (death), p. 249; Vital Records, Massachusetts State Archives, Boston; "Massachusetts: Vital Records, 1841-1910," digital images, AmericanAncestors.org(https://www.americanancestors.org/search/databasesearch/191/massachusetts-vital-records-1841-1910 : accessed 3 Feb 2019). 27Douglas deaths, 1925, Loren A. Buffum, vol. 18, p. 455; Vital Records, Massachusetts State Archives, Boston. 28"Massachusetts, Town and Vital Records, 1620-1988," database with images, Ancestry.com (https://search.ancestry.com/search/db.aspx?dbid=2495 : accessed 2 Feb 2019); "Douglas Records of Births, Deaths, & Marriages 1718-1843, Vol 1," p. 81, Douglas Town Clerk's office, Douglas, Massachusetts. 29"Massachusetts, Town and Vital Records, 1620-1988," database with images, Ancestry.com (https://search.ancestry.com/search/db.aspx?dbid=2495 : accessed 2 Feb 2019); "Douglas Records of Births, Deaths, & Marriages 1718-1843, Vol 1," p. 15, Douglas Town Clerk's office, Douglas, MA. 30Douglas births, 1843, Julius Whelock, vol. 18, p. 455; Vital Records, Massachusetts State Archives, Boston; "Massachusetts: Vital Records, 1841-1910," digital images, AmericanAncestors.org (https://www.americanancestors.org/search/databasesearch/191/massachusetts-vital-records-1841-1910 : accessed 3 Feb 2019). 31"Douglas Records of Births, Deaths, & Marriages 1718-1843, Vol 1," Young-Buffum, pp. 157, 225, Douglas Town Clerk's office, Douglas, Massachusetts; "Massachusetts, Town and Vital Records, 1620-1988," database with images, Ancestry.com (https://search.ancestry.com/search/db.aspx?dbid=2495 : accessed 2 Feb 2019). 32Philetus Buffum (Pvt., Regiment 24, Company H, Infantry, Civil War), pension application no. 159,188, certificate no. 120,197; database with images, Fold3.com (https://www.fold3.com/title/24/civil-war-widows-pensions : accessed 9 Mar 2019), search for "Philetus Buffum." 331900 U.S. census, Douglas, Worcester County, Massachusetts, ED 1603, dwelling 149, family 175, pg. not given, Sophia Buffum in the Loren A. Buffum household. 34Worcester County, Massachusetts, probate case 29047, series B, 1901, Sophia Buffum will, Worcester County Probate and Family Court, Worcester. 35Perkins, Buffum Family, p. 168. 36Vital Records of Douglas Massachusettts, to the End of the Year 1849 (Worcester, MA: Franklin P. Rice, 1906), p. 158; images, AmericanAncestors.org (https://www.americanancestors.org/databases/massachusetts-vital-records-1620-1850 : accessed 26 March 2019). 37Roderick B. Sullivan, WheelockGenealogy.com (http://www.wheelockgenealogy.com/ralphdsc/d0004/g0000038.html#I3622 : accessed 26 March 2019), Olive Wheelock family group sheet. 38Vital Records of Douglas Massachusetts, to the End of the Year 1849, p. 170. 39For births, see "Douglas Records of Births, Deaths, & Marriages 1718-1843, Vol 1," p. 15. 40For marriage, see Thomas W. Baldwin, Vital Records of Uxbridge, Massachusetts to the Year 1850 (Boston: Wright & Potter Printing, 1916), p. 220; "Massachusetts, Town and Vital Records, 1620-1988," database with images, AmericanAncestors.org (https://www.americanancestors.org/search/databasesearch/190/massachusetts-vital-records-1620-1850 : accessed 26 March 2019); for death, see Douglas deaths, 1908, Benjamin Buffum, vol. 1908/33 death, p. 57; Vital Records, Massachusetts State Archives, Boston; "Massachusetts: Vital Records, 1841-1910," digital images, AmericanAncestors.org(https://www.americanancestors.org/search/databasesearch/191/massachusetts-vital-records-1841-1910 : accessed 3 Feb 2019). 41For marriage, see Thomas W. Baldwin, Vital Records of Mendon, Massachusetts to the Year 1850 (Boston: Wright & Potter Printing), p. 256; for death, see Worcester deaths, 1896, Paul Buffum, vol. 465, p. 793; Vital Records, Massachusetts State Archives, Boston. 42For marriage, see Thomas W. Baldwin, Vital Records of Uxbridge, Massachusetts to the Year 1850, p. 220; for death, see Douglas deaths, 1894, Daniel Buffum, vol. 447, p. 595, Vital Records, Massachusetts State Archives, Boston. 43For marriage, see "Rhode Island Town Marriages Index, 1639-1916," database, FamilySearch.org (https://familysearch.org/ark:/61903/1:1:F8VR-PQN : accessed 24 March 2019), Buffum-Ray marriage; citing Cumberland, Providence, Rhode Island, town halls, and Rhode Island Historical Society, Providence; FHL microfilm 428; for death, see Uxbridge deaths, 1896, Farnum Buffum, vol. 465, p. 723, Vital Records, Massachusetts State Archives, Boston. 44For marriage, see "Rhode Island Town Marriages Index, 1639-1916," database, FamilySearch.org (https://familysearch.org/ark:/61903/1:1:Q24H-376V : accessed 24 March 2019), Slocum-Buffum marriage; citing Providence, Providence County, Rhode Island, town halls, Rhode Island Historical Society, Providence; FHL microfilm 63; for death, see "Rhode Island Deaths and Burials, 1802-1950," database with images,FamilySearch.org (https://familysearch.org/ark:/61903/1:1:F86G-421 : accessed 3 Feb 2019), Hannah M. Slocum death record; Lincoln, Providence County, Rhode Island; FHL microfilm 2,156,312. 451840 U.S. census, Douglas, Worcester County, Massachusetts, p. 76 (stamped), Benjamin Buffum household; NARA microfilm publication M704, roll 201; digital images FamilySearch.org(https://familysearch.org/ark:/61903/1:1:XHTX-HR2 : retrieved 25 March 2019); also 1850 U.S. census, Douglas, Worcester County, Massachusetts, dwelling 140, family 137, pg. 343 (stamped), Benjamin Buffum household; also 1855 Massachusetts state census, Douglas, Worcester County, Massachusetts, dwelling 102, family 122, Benjamin Buffum household; also 1860 U.S. census, Douglas, Worcester County, Massachusetts, dwelling 138, family 152, p. 17 (handwritten), Aldis Humes household. 46Worcester County, Massachusetts, deed 421:492; Registry of Deeds, Worcester; "Massachusetts Land Records, 1620-1986," FamilySearch.org (https://www.familysearch.org/search/collection/2106411 : accessed 26 March 2019), Worcester County, vol 420–421, image 602. 47Worcester County, Massachusetts, deed 507:176; Registry of Deeds, Worcester; "Massachusetts Land Records, 1620-1986," FamilySearch.org, Worcester County, vol 507-508, image 95. 48Worcester County, Massachusetts, deed 507:177; Registry of Deeds, Worcester; "Massachusetts Land Records, 1620-1986," FamilySearch.org, Worcester County, vol 507-508, image 95; also Worcester County, Massachusetts, deed 588:260 (amended); Registry of Deeds, Worcester; "Massachusetts Land Records, 1620-1986," FamilySearch.org, Worcester County, vol 587-588, image 488. 49Douglas marriages, 1863, Buffum-Humes, vol. 164, p. 164, Vital Records, Massachusetts State Archives, Boston; "Massachusetts: Vital Records, 1841-1910," digital images, AmericanAncestors.org. 50Douglas marriages, 1864, Buffum-Shove, vol. 173, p. 189; Vital Records, Massachusetts State Archives, Boston; "Massachusetts: Vital Records, 1841-1910," digital images, AmericanAncestors.org. 51Douglas deaths, 1910, Phebe Young, vol. 1910/34 (death), p. 475 (amended); Vital Records, Massachusetts State Archives, Boston; "Massachusetts: Vital Records, 1841-1910," digital images,AmericanAncestors.org. 52Uxbridge deaths, 1911, Emeline Whipple, vol. 1911/99 (death), p. 249; Vital Records, Massachusetts State Archives, Boston; "Massachusetts: Vital Records, 1841-1910," digital images, AmericanAncestors.org. 53Douglas deaths, 1925, Loren A. Buffum, vol. 18, p. 455; Vital Records, Massachusetts State Archives, Boston. 54Arnold, Vital Record of Rhode Island, 1636 - 1850: First Series, Births, Marriages, and Deaths, Burrillville, Vol 3, Part 2 , p. 16. 55Worcester deaths, 1861, Benjamin Buffum, vol. 149, p. 315, Vital Records, Massachusetts State Archives, Boston; "Massachusetts: Vital Records, 1841-1910," digital images, AmericanAncestors.org. 571855 Massachusetts state census, Douglas, Worcester County, Massachusetts, dwelling 132, family 161, Asa T. Dudley household; State Archives, Boston; FHL microfilm 953,962; database with images,FamilySearch.org (https://familysearch.org/ark:/61903/1:1:MQ4D-VLW : accessed 25 March 2019). 581860 U.S. census, Douglas, Worcester County, Massachusetts, dwelling 344, family 379, pg. 505 (handwritten), Willard Whipple household. 591860 U.S. census, Uxbridge, Worcester County, Massachusetts, dwelling 715, family 1051, pg. 135 (handwritten), Loren Buffum in Stephen Paine household; NARA microfilm publication M653, roll 531; digital images, FamilySearch.org (https://familysearch.org/ark:/61903/1:1:MZC3-P2B : accessed 25 March 2019). 601860 U.S. census, Douglas, Worcester County, Massachusetts, dwelling 138, family 152, p. 17 (handwritten), Benjamin Buffum in Aldis Humes household; NARA microfilm publication M653, roll 533; digital images, FamilySearch.org (https://familysearch.org/ark:/61903/1:1:MZH2-TG6 : accessed 25 March 2019). 61Worcester County, Massachusetts, probate case 17820, series A, 1847, Samuel Dudley (of Douglas) will, Worcester County Probate and Family Court, Worcester; images, "Massachusetts, Worcester County, Probate Files, 1731-1925," FamilySearch.org (https://www.familysearch.org/search/collection/2102083 : accessed 27 March 2019), Case no 17817-17899, image 24. 62Worcester County, Massachusetts, probate case 44817, series A, 1864, Stephen Paine (of Uxbridge) administration, Worcester County Probate and Family Court, Worcester; images, "Worcester County, MA: Probate File Papers, 1731-1881," AmericanAncestors.org (https://www.AmericanAncestors.org : accessed 27 March 2019), search for "Stephen Paine." 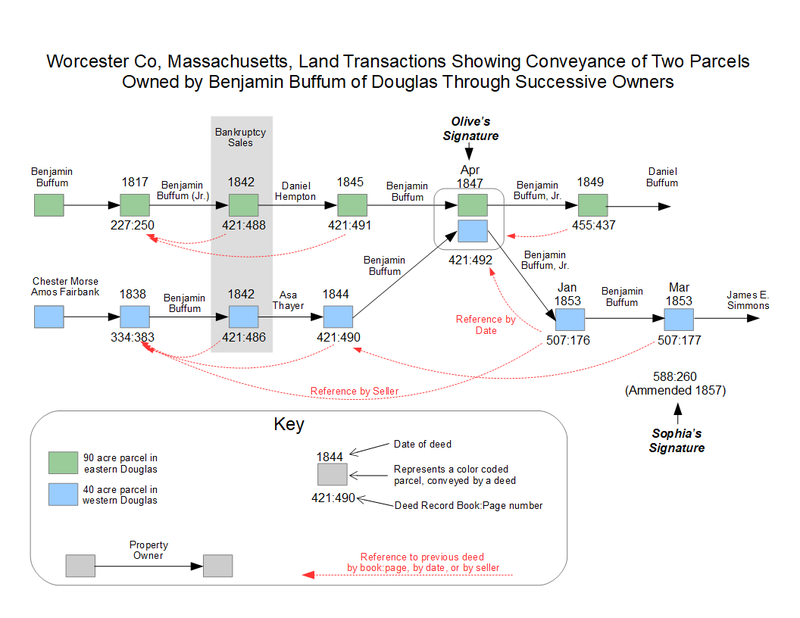 63Worcester County, Massachusetts, deeds 421:486, Benjamin Buffum to Asa Thayer, and 421:488, Benjamin Buffum to Daniel Kempton; Registry of Deeds, Worcester; "Massachusetts Land Records, 1620-1986,"FamilySearch.org (https://www.familysearch.org/search/collection/2106411 : accessed 26 March 2019), Worcester County, Deeds 1847 vol 420–421, starting at image 600. 641850 U.S. census, Douglas, Worcester County, Massachusetts, dwelling 140, family 137, pg. 343 (stamped), Benjamin Buffum household, zero real estate value; also 1860 U.S. census, Douglas, Worcester County, Massachusetts, dwelling 138, family 152, p. 479 (handwritten), Benjamin Buffum in Aldis Humes household, zero real estate value. 65Worcester County, Massachusetts, deeds 507:176, Benjamin Buffum Jr to Benjamin Buffum, and 507:177, Benjamin Buffum to James E. Simmons; Registry of Deeds, Worcester; "Massachusetts Land Records, 1620-1986," FamilySearch.org (https://www.familysearch.org/search/collection/2106411 : accessed 26 March 2019), Worcester County, Deeds 1853 vol 507-508, starting at image 95. 66Philetus Buffum (Pvt., Regiment 24, Company H, Infantry, Civil War), pension application no. 159,188, certificate no. 120,197, Deposition of Asa Thayer and Wellington Young; database with images, Fold3.com(https://www.fold3.com/title/24/civil-war-widows-pensions : accessed 9 Mar 2019), search for "Philetus Buffum," WC120197, p. 19. 67"Douglas Records of Births, Deaths, & Marriages 1718-1843, Vol 1," p. 15, Douglas Town Clerk's office, Douglas, Massachusetts; "Massachusetts, Town and Vital Records, 1620-1988," database with images, Ancestry.com (https://search.ancestry.com/search/db.aspx?dbid=2495 : accessed 2 Feb 2019) > Douglas > Births, Marriages, and Deaths > p. 15. 68Vital Records of Douglas Massachusettts, to the End of the Year 1849 (Worcester, MA: Franklin P. Rice, 1906), p. 90; also "Douglas Records of Births, Deaths, & Marriages 1718-1843," Vol. 1, pp. 157, 225; viewed at "Massachusetts, Town and Vital Records, 1620-1988," database with images, Ancestry.com (https://search.ancestry.com/search/db.aspx?dbid=2495 : accessed 2 Feb 2019) > Douglas > Births, Marriages, and Deaths > pp. 157, 225. 69Douglas deaths, 1910, Phebe Young, vol. 1910/34 (death), p. 475 (amended); Vital Records, Massachusetts State Archives, Boston; "Massachusetts: Vital Records, 1841-1910," digital images,AmericanAncestors.org. 70"Douglas Records of Births, Deaths, & Marriages 1718-1843," Vol. 1, p. 81, Emeline Wheelock birth; also Vital Records of Douglas Massachusettts, to the End of the Year 1849, p. 158, Wheelock-Whipple marriage; also "Douglas Records of Births, Deaths, & Marriages 1844-1860," Vol. 2, unnumbered pages, Wheelock-Whipple mariage, Douglas Town Clerks office, Douglas, Worcester County, Massachusetts. 71Uxbridge deaths, 1911, Emeline Whipple, vol. 1911/99 (death), p. 249; Vital Records, Massachusetts State Archives, Boston; "Massachusetts: Vital Records, 1841-1910," digital images, AmericanAncestors.org. 721850 U.S. census, Douglas, Worcester County, Massachusetts, dwelling 140, family 137, pg. 343 (stamped), Phyletus Wheelock in Benjamin Buffum household; also 1855 Massachusetts state census, Douglas, Worcester County, Massachusetts, dwelling 132, family 161, Phyletus Wheelock in Asa T. Dudley household; also 1860 U.S. census, Douglas, Worcester County, Massachusetts, dwelling 344, family 379, pg. 505 (handwritten), Phyletus Wheelock in Willard Whipple household. 73Philetus Buffum (Pvt., Regiment 24, Company H, Infantry, Civil War), pension application no. 159,188, certificate no. 120,197; "Civil War Widows Pensions," database with images, Fold3.com. 74Douglas marriages, 1863, Buffum-Humes, vol. 164, p. 164; Vital Records, Massachusetts State Archives, Boston; "Massachusetts: Vital Records, 1841-1910," digital images, AmericanAncestors.org. 75A May 1843 birth record for Julius Wheelock was found, this may be the birth record for Loren. See Douglas births, 1843, Julius Whelock, vol. 18, p. 455; Vital Records, Massachusetts State Archives, Boston. 761850 U.S. census, Douglas, Worcester County, Massachusetts, dwelling 140, family 137, pg. 343 (stamped), Loren Wheelock in Benjamin Buffum household. 77See previously cited 1855, 1860, 1870, 1880, 1900, census records, 1864 marriage record, and 1925 death record. For draft record, see "U.S., Civil War Draft Registrations Records, 1863-1865," database with images, Ancestry.com (https://www.ancestry.com/search/collections/consolidatedlistsofcivilwarreg : accessed 27 March 2019), search for "Lorin Buffum." 78Worcester County, Massachusetts, deed 645:367, Albert Whipple to Benjamin Buffum; Registry of Deeds, Worcester; "Massachusetts Land Records, 1620-1986," FamilySearch.org(https://www.familysearch.org/search/collection/2106411 : accessed 26 March 2019), Worcester County, Deeds 1861 vol 644-645, image 535; also deed 650:340, Albert Whipple to Daniel & Farnum Buffum; Registry of Deeds, Worcester; "Massachusetts Land Records, 1620-1986," FamilySearch.org (https://www.familysearch.org/search/collection/2106411 : accessed 26 March 2019), Worcester County, Deeds 1862 vol 649-650, image 515. 79Worcester County, Massachusetts, probate case 8749, series A, 1830, Benjamin Buffum (of Douglas) will, and probate case 8760, series A, 1838, Phebe Buffum (of Douglas) will, Worcester County Probate and Family Court, Worcester; images, "Massachusetts, Worcester County, Probate Files, 1731-1925," FamilySearch.org (https://www.familysearch.org/search/collection/2102083 : accessed 27 March 2019), Case no 8733-8819, images 140, 279. 80Worcester County, Massachusetts, probate case 20049, series B, 1896, Paul Buffum (of Worcester) will, Worcester County Probate and Family Court, Worcester; digital images, Ancestry.com(https://www.ancestry.com/search/collections/usprobatema : accessed 28 March 2019), search for "Paul Buffum." 81Lincoln, Providence County, Rhode Island, Letters, Vol. 3, letter of administration, p. 112, Probate Bonds, Vol. 2, administrators bond, p. 88; Lincoln Town Clerk's office; "Rhode Island, Wills and Probate Records, 1582-1932," digital images, Ancestry.com (https://www.ancestry.com/search/collections/usprobateri : accessed 28 March 2019), search for "Hannah M. Slocum." 82Worcester County, Massachusetts, probate case 16575, series B, 1894, Daniel Buffum (of Douglas) will, Worcester County Probate and Family Court, Worcester. 83Worcester County, Massachusetts, probate case 20052, series B, 1896, Farnum Buffum (of Uxbridge) administration, Worcester County Probate and Family Court, Worcester. 84Worcester County, Massachusetts, probate case 47346, series B, 1910, Phebe Young (of Douglas) administration, and probate case 85130, series B, 1925, Loren A. Buffum (of Douglas) will, Worcester County Probate and Family Court, Worcester. Emeline Whipple and Phyletus Buffum left no probate records. 85Dr. Elizabeth Sheff, "Three Waves of Non-Monogamy: A Select History of Polyamory in the United States," Sheff Consulting, https://elisabethsheff.com, Blog, posted 9 September 2012 (https://elisabethsheff.com/2012/09/09/three-waves-of-polyamory-a-select-history-of-non-monogamy/85 : accessed 28 March 2019), paragraphs 1-4. 86Sophia apparently has no direct male line descendants living past 1950, eliminating the possibility of Y chromosome matches. 87Worcester County, Massachusetts, deed 421:492. 88Worcester County, Massachusetts, deed 507:176. 89Worcester County, Massachusetts, deed 507:177. 90Worcester County, Massachusetts, deed 588:260 (amended). 91Worcester County, Massachusetts, deed 507:176, in which the reference to earlier deed 421:492 is phrased as "being a part of the land conveyed to grantor by deed of grantee in April 1847." 92Worcester County, Massachusetts, deed 507:176, in which the parcel is identify as "being the same that was conved [conveyed] formerly to said Benjamin Buffum by the Congregational Society in Douglas or some other persons by Chester Morse and Amos Fairbanks and which said deed is supposed to be recorded." The referenced deed is 334:383, Chester Morse and Amos Fairbanks to Benjamin Buffum, 16 July 1838. 93Worcester County, Massachusetts, deed 507:176, signed 22 January 1853. 94Worcester County, Massachusetts, deed 507:177, signed 31 March 1853. 95Worcester County, Massachusetts, deed 507:177, in which the property conveyed to James E. Simmons is identified "as the same tract of land quitclaimed to me [Benjamin Buffum] by Asa Thayer by deed recorded in the Registry of deed for said County Book 421, Page 490," which in turn refers to the parcel as "a tract of parcel of Real Estate formerly conveyed from Chester Morse and Amos Fairbank to Benjamin Buffum by a deed bearing date the 16th day of July A.D. 1838 and recorded in the Registry of deeds a Worcester Book 334, Page 383." 96Worcester County, Massachusetts, deed 588:260, Sophia Buffum to James E. Simmons, 17 October 1857. 97Worcester, Worcester County, Massachusetts, deed indexes, grantor and grantee, Registry of Deeds, Worcester; "Massachusetts Land Records, 1620-1986," digital images, FamilySearch.org(https://www.familysearch.org/search/collection/2106411 : accessed 28 March 2019), negative (manual) search for a Benjamin Buffum as grantor or grantee in deeds recorded between 1853 and 1859, signed between the dates 22 January 1853 and 31 March 1853, for transactions involving the 40 acre parcel identified in 334:383. 981820 U.S. census, Douglas, Worcester County, Massachusetts, Benjamin Buffum, Jr. household; 1830 U.S. census, Douglas, Worcester County, Massachusetts, pg. 238 (handwritten), Benjamin Buffum Jr. household; NARA microfilm publication M19, roll 68; digital images FamilySearch.org (https://familysearch.org/ark:/61903/1:1:XH58-36R : retrieved 25 March 2019); 1840 U.S. census, Douglas, Worcester County, Massachusetts, p. 76 (stamped), Benjamin Buffum household. 99"Douglas Records of Births, Deaths, & Marriages 1718-1843," Vol. 1, pp. 157; viewed at "Massachusetts, Town and Vital Records, 1620-1988," database with images, Ancestry.com.